Diagonal honey extractors There are 43 products. Tangential honey extractor, Ø500mm, 3-frame, manual drive, CLASSIC LINE. Tangential honey extractor, Ø500mm, 3-frame, electric drive, CLASSIC LINE. Tangential honey extractor, Ø500mm, 3-frame, manual and electric drive, CLASSIC LINE. Honey extractor with a small drum diameter that holds 5 frames of Langstroth inside the basket. A characteristic feature of diagonal honey extractor is the need to turn the frames. They are intended primarily for beekeepers with smaller apiaries. Tangential honey extractor, Ø600mm, 4-frame, manual drive, CLASSIC LINE. 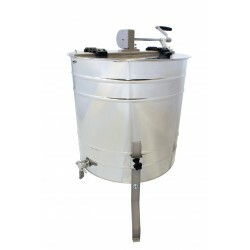 5-frame diagonal honey extractor with a diameter of 600mm is made of acid-proof stainless steel 0H18N9.The bottom was made in the shape of a cone that allows you to completely empty the drum with honey. 5-frame diagonal extractor with a diameter of 600mm is made of acid-proof stainless steel 0H18N9.In addition, the bottom was made in the shape of a cone that allows you to completely empty the drum with honey. Bottom electric drive. See the video. Honey extractor with a small drum diameter that accommodates 4 frames of Langstroth inside the basket. A characteristic feature of Diagonal Hedges is the need to turn the frames. Diagonal honey extractors are intended for beekeepers with smaller apiaries. Drum with a diameter of 500mm. Honey extractor with a small drum diameter that holds 4 frames of Langstroth inside the basket. A characteristic feature of the Diagonal Hedges is the necessity of turning the frames. They are intended primarily for beekeepers with smaller apiaries, whose workshops are equipped with access to electricity.See video. Honey extractor with a small drum diameter that holds 4 frames of Langstroth inside the basket. Diagonal honey extractors are intended for beekeepers with smaller apiaries. A characteristic feature of diagonal honey extractor is the need to turn the frames.See the video. Tangential honey extractor, Ø600mm, 4-frame, manual and electric drive, CLASSIC LINE.